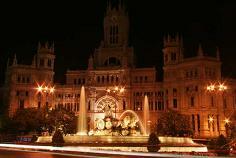 At the top of the page is one of the most famous Madrid monuments, Puerta Alcala. 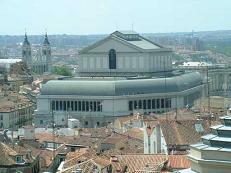 It has probably "piqued" your curiosity and now you want to know more about it and other famous landmarks in Madrid? 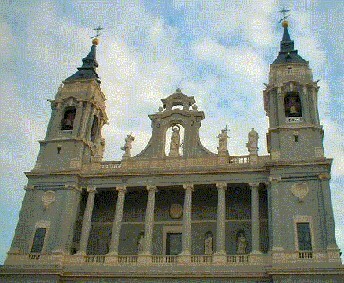 If there is anything Madrid has an abundance of, apart from Museums, it is Monuments! The wealth of the Spanish empire had to be spent somehow and Madrids many monuments remain a testament to the influx of funds during richer times. 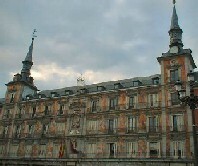 This section contains directions to and a brief history of the principal Madrid landmarks along with their opening times. After all, how many times have you arrived home after a vacation, finally got the guide book out and realised there was something you missed? Built in 1738 upon the site of the previous castle that was destroyed in an accidental fire the Royal Palace has comanding views over Southern Madrid and the river Manzanares. Now only used somewhat occasionally by the Spanish Royal family its rooms have been opened to tourists and guided tours are available. The Palaces central location next to Plaza de España means it is within a 5 minute walk of almost all central madrid hotels. Conveniently in front of the Royal Palace this is one of Madrids newest landmarks having only been officially opened by Pope John Paul II as recently as 1993. From in front of the cathedral you can see parts of the Madrid city wall dating back to the 9th Century AD as well as the palace courtyard. Providing an excellent contrast between modern day and ancient Madrid monuments. Commemerative arches in the middle of a roundabout signifying one of the five ancient enterances to the city. It is frequently decked out for concerts / rallies / sporting events and the Eurovision song contest. From the base of the monument you can overlook the main road into Sol as well as Ciebeles, Banco de España and the Metropolis buildings. A quick 180 degree turn will have the sancturary of Retiro park in front of you. A veritable oasis of 350 plus acres of park in which to escape the chaotic Madrid traffic. In summer one of the few places with shade and where you are able to enjoy a gentle stroll without suffering the heat. Within the park itself there area a large number of statues and many of the smaller Madrid monuments to inspect. At the end of May a 200 plus stall book market takes place as well as numerous concerts throughout the year. In addition there is a glass exhibition hall and a lake for boating. Only problem you may have is finding your way around! Opening Hours: Another of the Madrid monuments of the free standing type. 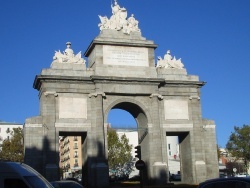 In the same manner as the Puerta Alcala the Puerta de Toledo is a prominent Madrid landmark signifying the old enterance to the city from the city of Toledo. If you are visiting either El rastro Sunday market or heading to a football match at Atletico Madrids Vincente Calderon stadium you´ll be sure to pass by the "puerta" or door, as it is translated into English. Located just in front of the Main post office this is the largest roundabout on the castellana and at its centre is an ornately decorated fountain depicting Neptune and his chariot. The sheer size of this monument takes the breath away. Frequently the starting and/or finishing point for many of Madrids sporting events it is converts to an open air party for 20,000 plus people should Real madrid win a Trophy! 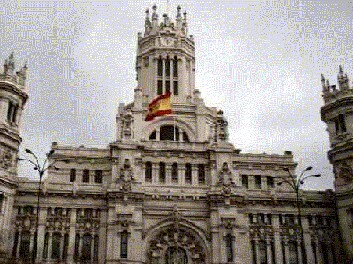 Some would think it strange that a post office could be a considered a Madrid monument however Madrids main post office is exactely that. Dominating one side of Plaza Ciebeles its four storey turreted structure dates from the begining of the 20th Century and took 13 years to complete! If you want to send a postcard with a difference there are special counters inside the post office where they will stamp the card with a commemerative postmark. Be sure to take a walk inside the building. Dating from 1665 this is Madrids original town square and today still forms the centre of a number of religious and cultural events. Completely enclosed the sides of the five storey apartments form a giant canvas on which various city symbols and scenes were painted directly throughout its existence. Nowadays the lower levels are almost exclusively bars restaurants and tourist shops. However if you are in Madrid on a Sunday check out the Sunday collector Market! Finished with Madrid monuments? Check out some other Madrid attractions! or check for hotels next to these famous landmarks!